Facts are facts, but the facts you choose to tell change the story, and, in the case of perceptions of the ‘ideal body’, can fuel physical and mental health problems, with consequent costs to society and damage to individual lives. 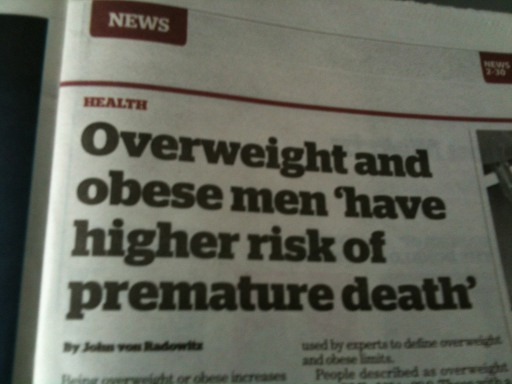 Today’s i newspaper includes an article entitled “Overweight and obese men ‘have higher risk of premature death’“. An online version of the same article “Obese men three times more likely to die early” appeared online yesterday on the iNews website. A similar article “Obesity is three times as deadly for men than women” reporting the same Lancet article appeared in yesterday’s Telegraph. 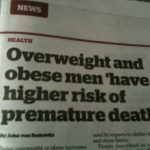 The text describes how moderately obese men die up to three years earlier than those of ‘normal’ weight1; clearly a serious issue in the UK given growing levels of child obesity and the fact that the UK has the highest levels of obesity in Europe. The i quotes professors from Oxford and the British Heart Foundation, and the Telegraph report says that the Lancet article’s authors suggest their results refute other recent research which found that being slightly heavier than ‘normal’ could be protective and extend lifespan. The things in the reports are all true. However, to quote the Witness Oath of British courts, it is not sufficient to tell “the truth”, but also “the whole truth”. The Telegraph article also helpfully includes a summary of the actual data in which the reports are based. As the articles say, this does indeed show substantial risk for both men and women who are mildly obese (BMI>30) and extreme risk for those more severely obese (BMI>35). However, look to the left of the table and the column for those underweight (BMI<18.5). The risks of being underweight exceed those of being mildly overweight, by a small amount for men and a substantial amount for women. While obesity is major issue, so is the obsession with dieting and the ‘ideal figure’, often driven by dangerously skinny fashion models. The resulting problems of unrealistic and unhealthy body image, especially for the young, have knock-on impacts on self-confidence and mental health. This may then lead to weight problems, paradoxically including obesity. The original Lancet academic article is low key and balanced, but, if reported accurately, the comments of at least one of the (large number of) article co-authors less so. However, the eventual news reports, from ‘serious’ papers at both ends of the political spectrum, while making good headlines, are not just misleading but potentially damaging to people’s lives. My feet are quite wide and so I prefer to wear sandals. 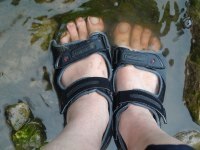 I wore sandals for over 700 miles of my round Wales walk back in 2013, and wear them throughout the winter. When the temperature drops below zero, or snow gathers on the ground, I am often asked, “don’t your feet get cold?“. 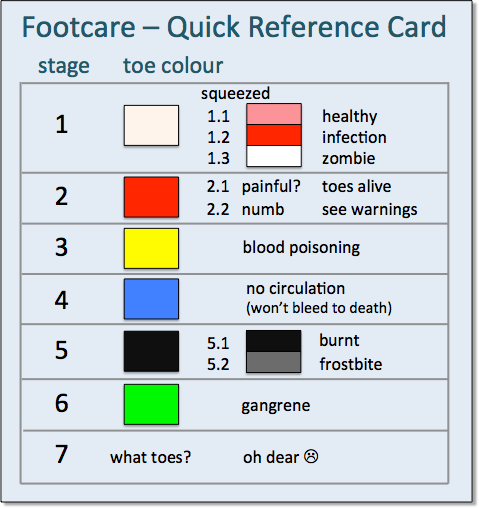 Having been asked so many times, I have decided to put down in writing my observations about healthy winter feet in the hope it will help others. Basically, the thing to remember is that it is all about colours, and follows a roughly linear series of stages. However, do note I am a sallow-skinned Caucasian, so all reference to skin colour should be read in that context. Press the side of your toe with your finger. Does it change colour? 1.1 Yes, it goes a bit pink and then fades rapidly back to white. That is normal and healthy, you clearly aren’t taking this whole extreme winter walking thing seriously. 1.2 Yes, it goes deep red and only very slowly back to white. You have an infection, maybe due to stage 2.2a on a previous walk. Visit the doctor to avoid stage 3. 1.3 No, it stays white. Bad news, you are a zombie. Well at least they are still alive. Well at least they don’t hurt. However numbness means does cause certain dangers. 2.2a – You might prick your toe on a thorns, or rusty wire and not notice, leading to infection. 2.2b – You might step on broken glass and bleed to death. 2.2c – You might step in a fire and burn yourself. Your circulation has stopped entirely. This will lead ultimately to limb death, but at least you won’t bleed to death (warning 2.2b). You forgot warning 2.2c didn’t you? 5.2 no, more dull grey/black. Frostbite, get to the hospital quick and they may save some of your toes. Gangrene, no time for the hospital, find a saw or large breadknife. You missed stages 5 and 6. 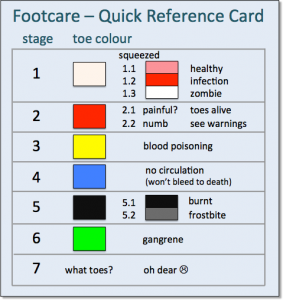 Download and print the Quick Reference Card so that you can conveniently check your foot health at any time. My feet are still (despite misuse!) healthy. However, for many this is a serious issue, not least for those with diabetes. When I was child my dad, who was diabetic, dropped a table on his foot and had to be constantly monitored to make sure it didn’t develop into gangrene. Diabetes UK have their own foot care page, and a list of diabetes charities you can support. 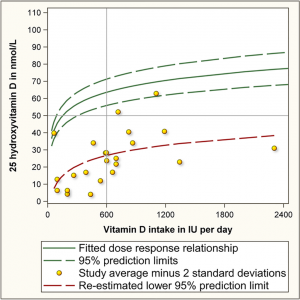 Ramesh Ramloll recently posted on Facebook about two apparently contradictory news reports on vitamin D, one entitled “Recommendation for vitamin D intake was miscalculated, is far too low, experts say” and the other “High levels of vitamin D is suspected of increasing mortality rates“. 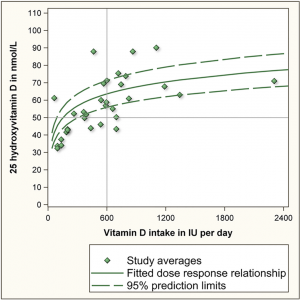 While specifically about diet and vitamin D intake, there seems to be a number of lessons from this: about communication of science (Ramesh’s original reason for posting this), widespread statistical ignorance amongst scientists (amongst others), and the fact that individuals are not averages. Science reporting is broken, or science itself is broken … the masses are like deer in headlights when contradictory recommendations through titles like these appear in the mass media, one week or so apart. I know that rickets is currently on the increase in the UK, due partly to poverty and poor diets leading to low dietary vitamin D intake, and due partly to fear of harmful UV and skin cancer leading to under-exposure of the skin to sunlight, our natural means of vitamin D production. So these issues are very important, and as Ramesh points out, clarity in reporting is crucial. Looking at the two articles, the ‘too low’ article came from North America, the ‘too much’ article, although reported in AAAS ‘EurekaAlert!’ news, originated in University of Copenhagen, so I thought that maybe the difference is that health conscious Danes are simply overdosing. However, even as a scientist, making sense of the reports is complicated by the fact that they talk in different units. The ‘too low’ one is about dietary intake of vitamin D measured in ‘IU/day’, and the Danish ‘too much’ report discusses blood levels in ‘nanomol per litre’. Wow that makes things easy! Furthermore the Danish study (based on 247,574 Danes, real public health ‘big data’) showed the difference between ‘too much’ and ‘too little’, was a factor of two, 50 vs 100 nanomol/litre. It suggests, Goldilocks fashion, that 70 nanomol/liter is ‘just right’. Note however, the ‘EurekaAlert!’ news article does NOT quantify the relative risks of over and under dosing, which does make a big difference to the way they should be read as practical advice, and does not give a link to the source article to find out (this is the AAAS!). Digging a little deeper into the “too low” news report, it is based on an academic article in the journal ‘Nutrients’, “A Statistical Error in the Estimation of the Recommended Dietary Allowance for Vitamin D“, which is re-assessing the amount of dietary vitamin D to achieve the same 50 nanomol/litre level used as the ‘low’ level by the Danish researchers. The Nutrients article is based not on a new study, but a re-examination of the original meta-study that gave rise to the (US and Canadian) Institute of Medicines current recommendations. The new article points out that the original analysis confused study averages and individual levels, a pretty basic statistical mistake. 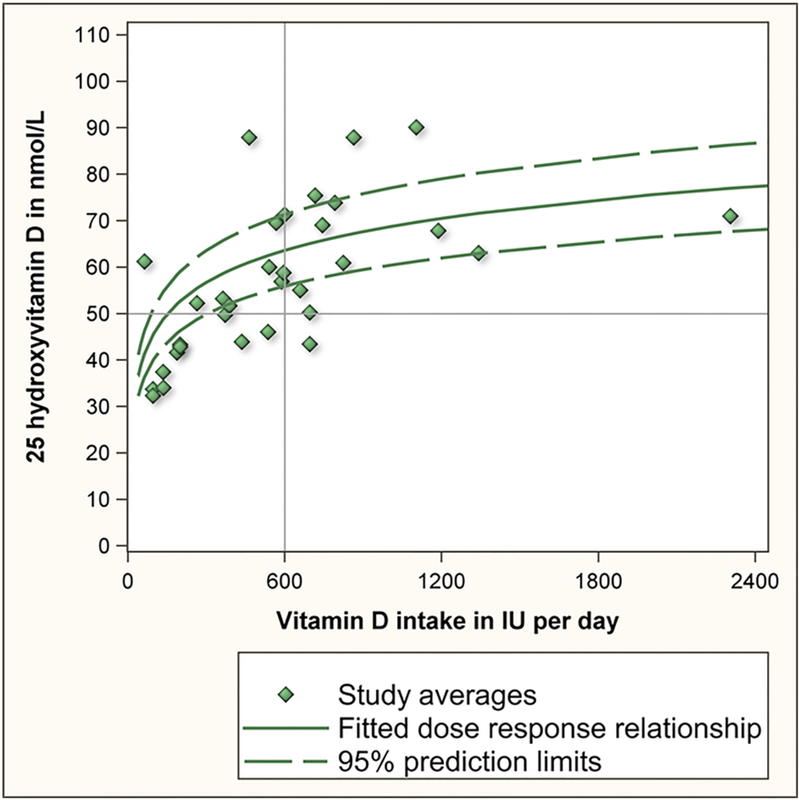 Graphs from “A Statistical Error in the Estimation of the Recommended Dietary Allowance for Vitamin D“. LHS is study averages, RHS taking not account variation within studies. 1) The level of statistical ignorance amongst those making major decisions (in this case at the Institute of Medicine) is frightening. This is part of a wider issue of innumeracy, which I’ve seen in business/economic news reporting on the BBC, reporting of opinion polls in the Times, academic publishing and reviewing in HCI, and the list goes on. This is an issue that has worried me for some time (see “Cult of Ignorance“, “Basic Numeracy“). 2) Just how spread the data is for the studies. I guess this is because individual differences and random environmental factors are so great. This really brings home the importance of replication, which is so hard to get funded or published in many areas of academia, not least in HCI where individual differences and variations within studies are also very high. But it also emphasises the importance of making sure data is published in such a way that meta-analysis to compare and combine individual studies is possible. 3) Individual difference are large. 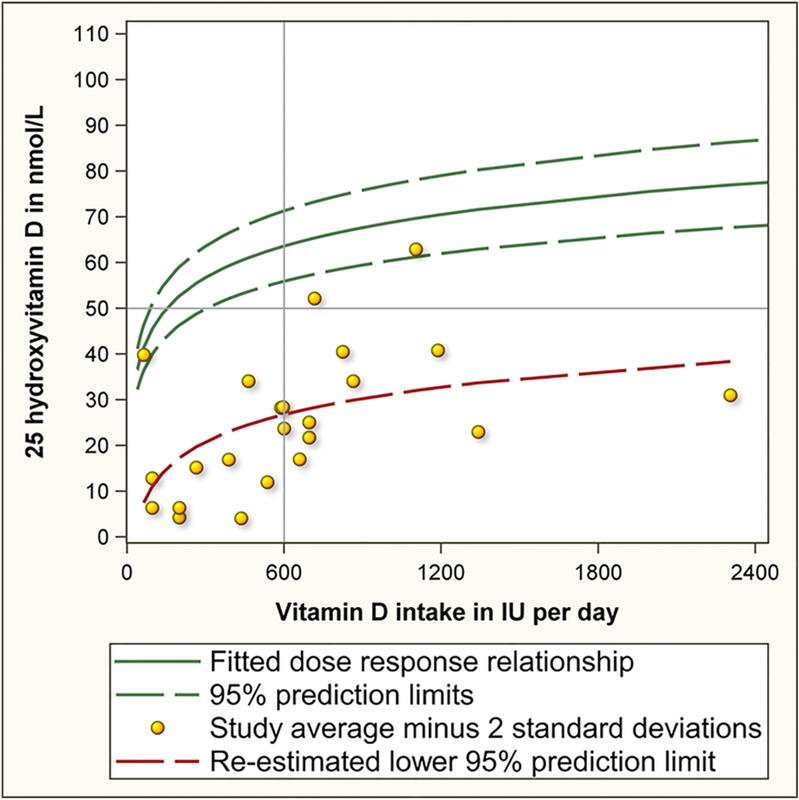 Based on the revised suggested limits for dietary vitamin D, designed to bring at least 39/40 people over the recommended blood lower limit of 50 nanomol/litre, half of people would end up with blood levels higher than four or five times that lower limit, that is more than twice as high as the level the other study says leads to deleterious over-consumption levels. This really brings home that diet and metabolism vary such a lot between people and we need to start to understand individual variations for health advice, not simply averages. This is difficult, as illustrated by the spread of studies in the ‘too low’ article, but may become possible as more mass data, as used by the Danish study, becomes available.